New Line Cinema has unveiled five character posters and new photos for the magician comedy The Incredible Burt Wonderstone, reteaming Bruce Almighty stars Steve Carell and Jim Carrey with Steve Buscemi and Olivia Wilde. Superstar magicians Burt Wonderstone (Carell) and Anton Marvelton (Buscemi) have ruled the Las Vegas strip for years, raking in millions with illusions as big as Burt’s growing ego. But lately the duo’s greatest deception is their public friendship, while secretly they’ve grown to loathe each other. Facing cutthroat competition from guerilla street magician Steve Gray (Jim Carrey), whose cult followingsurges with each outrageous stunt, even their show looks stale. But there’s still a chance Burt and Anton can save the act—both onstage and off—if Burt can get back in touch with what made him love magic in the first place. 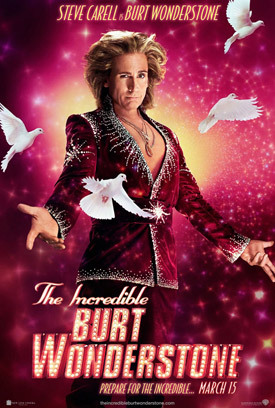 The Incredible Burt Wonderstone opens in theaters on March 15, 2013. You can see the posters and photos here.